Before the dissolution of the Soviet Union in the early 1990's, the population of the USSR was approximately only half Russian-speaking, and the percentages of Slavic speakers was declining. Even if Ukrainian, Belorussian and other Indo-European languages added, still a large proportion of the population spoke Altaic (Turkic, Mongolian etc. ), Caucasian (two families) and other non-Indo-European languages. Demographic trends indicated their percentages would increase. Before the Soviet Revolution (1917) only Russian was an official language, but some of the "Christianized" groups (Armenians, Georgians, Baltic peoples, Finns?) used their own languages and had for some time. Other groups' languages were not reduced to writing, or had been used for limited purposes; the Muslim populations of Central Asia and some of the Caucasus may have used Arabic or their own languages with Perso-Arabic script, but literacy was very limited. Poles, Ukrainians and Belorussians were not so lucky; the plan was to russify them, increasingly in the late 19th century. For other groups, such as the Poles, under Russian occupation since the late 1700's (Russia, Austria and Germany partitioned Poland) there was an attempt to Russify them; in schools during this period only Russian could be used, but covertly the Poles used Polish. In the Grand Duchy of Finland, part of the Russian Empire since the end of the Napoleonic Wars, Swedish and Finnish were tolerated, and attempts at Russification were not so blatant. Before the Revolution, Lenin and the Bolsheviks, meeting clandestinely in various places, developed a strategy (1903) on language that would have, at first, continued the hegemony of Russian in Slavic areas at least, but under pressure from especially the Poles, a more tolerant and pluralist policy was planned. After 1912 the terms were made explicit: the right to secede, the right to use their own languages, organize their cultural life freely, etc. The revolutionary policy (10th Congress, 1921) abandoned russification and proceeded to implement the pluralist policy, but reserving a role for Russian, as centrist meaning that it would be the lingua franca, the language used by the military, in meetings of the Supreme Soviet, by the central government, etc. The national languages would be used at the periphery, in territories set up for them. Much discussion was made about russification, even ongoing russification in the RSFSR (the Russian Republic) of Ukrainian etc. minorities, but it was clear from the start that a tension between the two would always exist, and that even when russification was under attack, it would covertly continue to exist, and would surface from time to time. Russian language in particular would struggle against "national culture" (i.e. too much regional power, regional language) which was "bourgeois". Nations were eventually to be abolished, and people would live without nationalism (a bourgeois concept) in peace and harmony; and this would be done, within the USSR, with Russian. Russian was therefore, in some sense, "neutral", i.e. not an ethnic language. Russian had always been the lingua franca, especially in the army, where men had been conscripted and had somehow learned it. Nowhere is it stated, but in effect Russian has personal status in the USSR (whereas ethnic languages only had territorial status ) because Russian was fully portable ; wherever Russian speakers went, their linguistic rights would be guaranteed, and they would never have to learn another language. The Soviet Census distinguished between narodnost' (ethnicity) and natsional'nost' (nationality). The former was determined by language spoken, the second by what ethnic group was declared, even if the ethnic language was not spoken. E.G., an Ukrainian living in Russia might declare her natsional'nost' to be Ukrainian but if she didn't speak Ukrainian, would declare her narodnost' to be Russian. (Many `Ukrainians' even those living in the Ukraine, especially in cities, didn't speak Ukrainian.) A comparison of figures on narodnost' and natsional'nost' in various censuses shows different totals, so some groups are losing their ethnicity (i.e. language) while still declaring themselves members of the nationality. Russians tend to be most retentive of language, while other groups vary; Ukrainians scored low on this; Jews even lower (loss of Yiddish language, but still classified as Jewish in `nationality'). In USSR, language was main criterion of nationality, but loss of language did not necessarily mean loss of nationality. Early policy : develop various languages, use them in for mass schooling, communications, public and professional life. (Covert goal: to sovietize (evangelize) the population.) This was the NEP, the New Economic Plan. 1938 on: universalize the knowledge of Russian. With this came forced cyrillicization of former roman or Arabic scripts. Covertly this is russification but overtly it was used to glorify and unify, and prepare for war with Germany. Other thrusts: divide and conquer the Turkic peoples of Central Asia by declaring their (mutually intelligible) languages to be separate. Kazakh, Uzbek, Uighur, Kirgiz (but not Tajik, which is Persian) were treated as separate, and pushed to developin separate ways lexically. Major languages were declared to be the national language of major Soviet constituent Republics (The Soviet Union was the Union of Soviet Socialist Republics ) and theoretically each republic could secede from the USSR; each had borders on the edge of the Soviet Union and could theoretically have done so. Minor languages located within constituent Republics did not do so well. Within the Russian Republic (RSFSR) there were also Autonomous Republics and Autonomous Regions where one or more languages enjoyed certain privileges. Click here for Some bibliography on Soviet and post-Soviet language policy. Click here for a set of maps of early Russia showing the expansion of the Russian Empire eastward to the Pacific. Click here for a map of an area that is ethnically and linguistically extremely diverse, the Caucasus, with several constituent (now ex-Soviet) Republics (Georgia, Armenia, Azerbaidzhan) flanked by ``autonomous republics" in the southern part of the Russian RSFSR, known as the ``north Caucasus." The number of named varieties of distinct languages and dialects spoken in this region is approximately 50.
click here for the list of 50 or more languages. click here for a discussion of the supposedly `vowelless' phonological system of Kabardian. Click here for material on Circassian History in the north Caucasus. Click here for a map of Central Asia, and the newly independent nations of that area. Click here for a map of the "major ethnic groups of Central Asia." Click here for a map of the western central Asian ethnic groups. Click here for a paper entitled "The cognition of ethnicity" by Francisco Gil-White, on self-declarations of ethnicity by Kazakhs, Mongols etc. in Central Asia. Click here for Marc LePretre's paper in html format. Groups could find their fortunes disrupted if they were politically suspect. Germans, who had an autonomous region in the Volga area before WWII, were deported (beginning in 1941) and dispersed in Central Asia, and lost their autonomy and language rights. Jews had a territory in the Far East, but it was abolished too. Finns who ended up in Karelia after the Soviet Union took over a large hunk of Finland during WWII had a "republic" for a while, but then the Karelian SSR was abolished and never heard from again. Ethnic Koreans, resident originally in the Far East, were removed and resettled in Central Asia. Some Caucasian language groups (especially the Chechens!) were deported to Central Asia after WWII for suspected collaboration with the Nazis. They were allowed in most cases to return home after Khrushchev denounced Stalinism, but resentments remain. These distributions were not fixed (or even declared anywhere), or even keyed to population size, but evolved according to local conditions. Whenever parental choice eventuated in switching to Russian medium, local language medium tapered off. And many schools were bilingual in medium, i.e. dual medium schools, with Russian and another language used in parallel, for the same students; perhaps differentiated by subject matter , perhaps by time of day. In some but not all Republics, the highest use option was available, e.g. in Georgia, the Baltics, Uzbekistan, Azerbaijan, Armenia, their languages are the main language of higher education; Ergo, some non-locals may also be studying through these languages. Developing these options means also developing textbooks, training teachers, establishing teacher training colleges, setting up printing presses, etc. and this has been one of the successes of the Soviet Union (though detractors always counter that the goal was to sovietize, not to extend linguistic rights.) Literacy was very high by the end of the Soviet period. They saw it as the easiest way to modernize and sovietize the country, and control things. Emphasizing terminological borrowing from Russian, to `facilitate' learning Russian, and penetration of Russian. From 1938, compulsary learning of Russian in all non-Russian schools. Even so, there was resistance to the borrowing from Russian, and some languages were more successful, e.g. Moldavian (actually a dialect of Romanian) which has borrowed freely from Romanian for various kinds of vocabulary. Other problems with russification: non-Russians not only had to learn Russian, they had to learn it with native-like pronunciation, syntax, etc. No tolerance for any local influences. This of course interfered with the learning of Russian, because it made the task so much harder. Russian and Soviet language policy has always contained elements of the Potemkin Village syndrome. This was the policy developed to deal with the desire of the Empress Catherine the Great to see her loyal subjects at work and to be sure they were happy and content. Since Catherine would have been appalled at the conditions that the peasants actually lived under, Prince Grigori Aleksandrovich Potemkin (one of her closest advisers built sanitized fake villages where cleaned-up peasants lived and worked in peace and harmony, singing folk songs and smiling as Catherine passed by. The Empress saw that things were good and returned to St. Petersburg, satisfied that her reign was benign, and that her people were happy. Soviet policies in particular have Potemkin aspects to them; the foreign visitor who wished to see how beautifully the Soviet language policy worked could see wondrous things, but they did not see the failures, the difficulties, and the resentments. 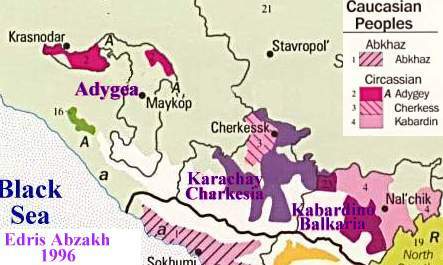 Soviet language and ethnicity policy was supposed to eliminate ethnic tensions but ethnic tensions instead festered and simmered under the surface (there are claims that Stalin, e.g., actually furthered ethnic tensions by some of his policies); the Armenian claim to the region of Nagorno-Karabakh (wholly contained within Azerbaijan, but ethnically Armenian) erupted before the breakup of the SU, and other antagonisms boiled to the surface quickly thereafter. Not one ethnic republic elected to remain in the US after the breakup (though Belarus may return to the fold), and the Commonwealth of Independent (Sovereign) States is heard from no more. And, within the Russian Republic itself, the myriad ethnic groups such as the Chechens (note that this is one of those groups that was deported to Central Asia after WWII for alleged collaboration with the Nazis; they were allowed to return in the late 1950's) threaten a further breakup. For another example of a Potemkin policy, cf. this report on sham (i.e. Potemkin-style) missile displays. From 1938 on, Soviet policy became one of universalizing the knowledge of Russian. With this came forced cyrillicization of former roman or Arabic scripts. Covertly this is a policy of �russification� but overtly it was used to glorify and unify, and prepare for the impending war with Germany. ��[T]he logical ground of Bolshevik policy towards nationalities after the Revolution�the korenizatsiia constituted a formula according to which those nations whose collective rights had been denied and repressed during the Tsarist period should have access to the free exercise of these rights within the general framework of the building of socialism in order to reach by themselves the conclusion that national sovereignty was not by itself a solution to all the national, cultural, social, politic and economic problems of development. The final goal was therefore the merger of all nations into a single socialist community, once all national cultures had had the opportunity to bloom during the period of construction of socialism. All this was stressed by Stalin at the 16th Congress of the CPSU (b) in 1930. Marrist ideology and Soviet (Marxist) Policy. � The basis is the economic structure of society at the given stage of its development. ���� Language, Marr held, is of the same type of superstructural social value as painting or art in general [and therefore can be manipulated by humans, and changed to fit the exigencies of theory.] Marr believed all languages in the world to be descended from one proto-linguistic megafamily, divided into three sub-families: the Hamitic, the Semitic, and the Japhetic (from which the Kartvelian and/or Caucasian languages descended, as well as many others).� Eventually, however �Japhetic� elements began to �appear� (or be discovered by Marr) in the most diverse languages; the Japhetic languages turned out to be �related� to (or perhaps were in fact the antecedent of) all languages; hence relationship by origin, or genetic relationship, lost all meaning. In the end, Marr rejected the whole notion of genetic affiliations, attempting to closely link Marrism with Marxism. He held that since all languages were essentially Japhetic, linguistic differences could be eliminated, and all languages would eventually merge, in the same way that the State would �wither away� and all peoples would merge, under Soviet sponsorship, of course. Which language would all languages merge into, and what would that language look like, i.e. which one would emerge as the universal one? Simple: rather than be a blend of all the world�s languages, it would resemble�Russian (of course). ���� So early Soviet Policy allowed the development of individual linguistic groups, which were supposed to pass through the stage of bourgeois development (�bourgeois nationalism�) only to then realize the futility of the bourgeois nationalist stage, and finally throw it all off.� Citizenship did not require any particular language adherence or knowledge, at first. But gradually it became clear that Russian was going to be important for citizens of the Soviet Union.� And Russian was indeed the language that was made available to all, since Russian had the �personal� right status that the other languages lacked, and because Russian was the �Big Brother� language from which other languages were supposed to borrow, especially terminology (for science and technology) that they lacked. "When Marr's hypothesis on linguistic kinship led to a contradiction of the facts of linguistic scholarship, he attempted to eliminate this contradiction by declaring all 'traditional' . . . linguistics antiquated and incompatible with Marxism (Great Soviet Encyclopaedia (15),1977:492). (b) To confuse language and superstructure is to commit a serious error. N. Y. Marr introduced into linguistics the incorrect, non-Marxist formula that language is a superstructure, and got himself into a muddle and put linguistics into a muddle. Soviet linguistics cannot be advanced on the basis of an incorrect formula.� (Stalin 1950:196-9, 203, 229). ���� Early Soviet Policy was thus tolerant and promotive of linguistic differences, and Soviet citizenship was thus not contingent on a knowledge of Russian. Later, however, the old (pre-revolutionary, and post-revolutionary covert) russifying tendency reasserted itself, partly justified by the Marrist idea, partly just plain old russification under the paternalist Big Brother leadership of the Russian people, who were thus primus inter pares. It is no wonder this idea crashed and burned in 1991, and that the Soviet Union collapsed so easily, and that all the old hostilities and tensions between various national groups reemerged in all their old virulence.� Soviet ideology about bourgeois nationalism and how it would wither away under socialism had totally masked and suppressed all the hostilities between various groups, rather than eliminate them.� When the suppression was lifted, the old tensions reemerged. Gremalschi, Anatol, (ed. )� (2002.) Educating Tolerance in Multicultural Societies: Roundtable Discussion Materials.� Chisinau: Soros Foundation-Moldova and ARC Publishing House. Great Soviet Encyclopaedia, (1977) Volume 15; New York. Lepr�tre, Marc. (2002) �Language Policies in the Soviet Successor States: a brief Assessment� on Language, Linguistic Rights and National Identity.� Papeles del Este, No. 3. Schiffman, Harold F. (2002a. )� �Linguistic Tolerance Policies: Can a Viable Model be Constructed for Moldova?�� In Gremalschi 2002, pp. 251-59. Stalin, Josef V.� (1950) (1): Great Soviet Encyclopedia, New York 1977: 196, 197-98, 199, 203, 229. The term korenizatsiia meant the �taking root� of language, the �indigenization� which would allow a bourgeois society to form. Marxist ideology held that this had to happen, and that it then had to be repudiated after it was realized what an impediment it was. But subcultures could not go from the �feudal� stage (where they were subservient to some other group) to the socialist stage without going through the bourgeois stage. Marr was the son� of a Georgian mother and a Scottish father who died when he was very young; he was thus raised within Georgian linguistic culture, and developed ideas that were strongly influenced by it; this seems to have appealed to Stalin as well, which explains why the latter espoused this rather outrageous theory. Click here for late-breaking news about Russian State Duma's banning of the roman alphabet. Harold F. Schiffman, haroldfs@ccat.sas.upenn.edu , last update November 19, 2002.